"Can I Make a Living Gold Mining? (Part 3)"
"Can I Make Living Gold Mining (Part 2)?" I suspect that some of my longer-term readers, many of whom are experienced miners, are wondering why I am addressing this topic yet again. The truth is my friends, that I continue to be bombarded with e-mail queries (primarily from those with little or no mining experience at all) about the "ins and outs" of having a go at small-scale placer mining as a single-point source of income. This is about the time that you veteran miners out there (myself included) start shaking your heads slowly from side-to-side and smiling to yourselves with that knowing look. I hear you. We, more than anyone else, know how easy it is to overestimate the dollar signs in gold mining and underestimate the difficulties involved in extracting even small amounts of gold by hand/small equipment methods. 1) The record high "spot" price of gold ($1,338.00 per troy ounce as I write this post). 2) The tough economic conditions in the country at large, more specifically, the nearly 10% unemployment rate nationwide. Fire up the old wood stove and throw these two factors into the "newbie" stew pot and guess what you end up with? A highly volatile mixture, that's what. I'll tell you straight, right here and now, that I am not an uncaring, unfeeling "rock" when it comes to conversing with these mining newcomers. I truly feel their pain because many of them have lost their jobs and are scrambling to keep life and limb together and support their families. So I try, in my own small way, to encourage their interest in small-scale gold mining while at the same time gently disabusing them of their unrealistic expectations. In some respects they are reminiscent of the inexperienced "down-and-outers" who grabbed picks and shovels and gold pans during the Great Depression when unemployment rates hit as high as 24.9% in 1933. But the difference between then and now is that in the 1930s you could pretty much choose your gold ground just about anywhere and set up camp long term, or even build a cabin in many locales (thereby cutting your "overhead" by a large margin). 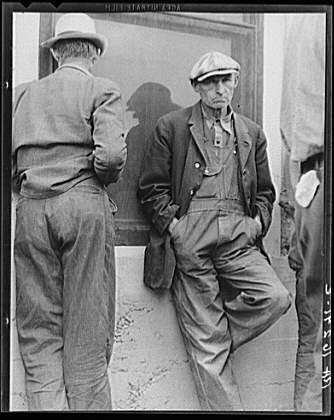 I have an immense amount of respect for those aspiring gold miners of the 1930s who found themselves with no job and without government hand-outs like unemployment checks or food stamps (yes, there were so-called "soup lines" in the larger cities). Some, like Jesse and Dot Coffey (their book, "Bacon and Beans From a Gold Pan," is a classic), managed to eke out a living of sorts by recovering enough placer gold to feed and clothe themselves until World War II came along and they could find good jobs again. The truth is, however, that most Depression-era miners were not able to sustain themselves through small-scale mining. Many, faced with the harsh realities of mining (e.g., great effort and hardship for very small amounts of gold), returned to the cities and countrysides once again to look for work. And for those of you who aspire to follow in their footsteps, the disadvantages are even greater today for reasons too numerous to list here. So to those "newbies" out there looking to make a go of mining to support themselves during our current hard times I wish you the very best. But without good gold ground to work and the knowledge and experience to make it happen, it'll be a tough one to pull off. Hell, it's a tough one to pull off for those of us who've been at this mining thing for quite a while, and that's the long and short of it. But I'll tell you this: I'd rather see a "down-and-outer" trying to make it happen through effort and hard work, no matter the difficulties, than I would seeing him or her throwing in the towel completely and becoming "enslaved" to Big Brother's government handouts.